Is there a looming financial crisis for Longmeadow? Two months ago Governor Deval Patrick announced significant cuts in budgets for most state departments after a $1.4 billion state budget shortfall. At the time there was no impact on local funding for cities and town. However, the Boston Globe reported on December 31 (see online story) that the governor was preparing up to $1.0 billion in additional cuts for the current fiscal year which may involve some cuts in local town/city funding. "There's a lot of pain, and it's going to have to be spread around," Patrick told reporters during a 30-minute briefing in his State House office. "Nobody's enjoying this. This is incredibly difficult." Possible emergency budget cuts being considered by the state will not effect FY2010…. cuts in local budgets to compensate for less state aid will need to be made now! In FY2009. Cuts made in the middle of a fiscal year are much more difficult to make because the budget funding deficit must be made up before July 1. In the yesterday’s Springfield Republican (1/04/09), it was reported that local western Massachusetts cities and towns were expecting a 5-10% cut in state for the upcoming FY2010… for Longmeadow that could be as much as $850,000. Let's hope that the Governor Patrick does not cut FY2009 local aid to cities and towns. 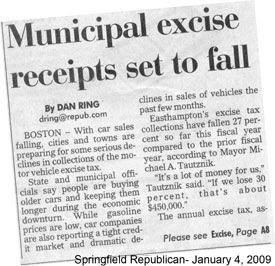 To add some additional worry for the current fiscal year, it was also reported in yesterday’s Springfield Republican that current motor vehicle excise tax collections for many towns/cities are down significantly for the current fiscal year. Based upon the budget information (see page 2 of ATM report) presented at the 2008 Annual Town Meeting, Longmeadow was expecting $2.15 million in excise tax revenue for the current FY2009 fiscal year budget. A short fall of 10% would mean that the town would have to cut $215,000 from the current FY2009 budget. In past years, the challenge to town leaders has been to prepare a balanced budget that meets the needs of our town for the upcoming fiscal year starting July 1. Let’s hope that we do not have make emergency cuts in town services before July 1 because of revenue funding shortfalls.